At the time It was a purely manual device with a 5-way switch to set the direction and speed with a rotary encoder to do fine adjustments. I wanted to turn it into an Ascom-driven device so I can use it remotely from my PC. It also needed a better way of attaching to the scope tube as I was using an old belt to keep it in place which wasn't always reliable. So, since then I have got to grips with writing Ascom drivers which isn't as painful as you might think. I chose C#, which I already had a grounding in and used Visual Studio 2010 and the Ascom Platform & Developer Tools. 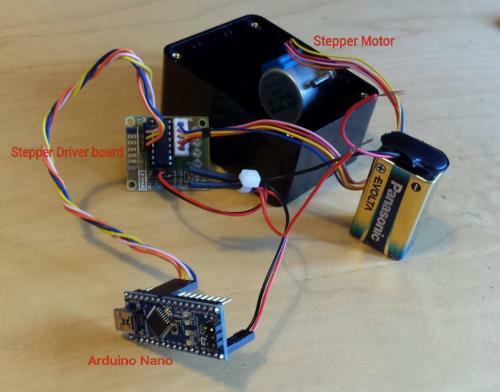 I have a working device based on an Arduino Nano and associated sketch. The sketch is a modified version of the one I wrote for the mk1 device with the code for the switch and rotary encoder removed. I have added additional code so the nano can interface with the Ascom Driver. I had to decide on the format of the messages sent to/from the nano by the driver but apart from that most of the work in the driver is already done for you in the template. I plan to document the driver, sketch and circuit diagram in due course. I have also decided to move the components to a smaller box to make it easier to fix to the scope. 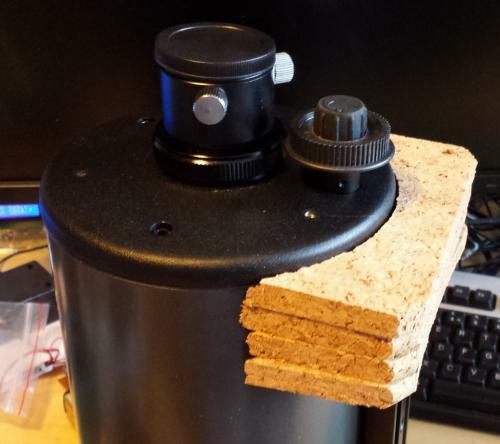 I needed a way to fix the device that was secure and simple. The dovetail bar on the ota projects back a little from the mount when it is clamped up and I made it longer still by removing it and replacing it reversed back to front. 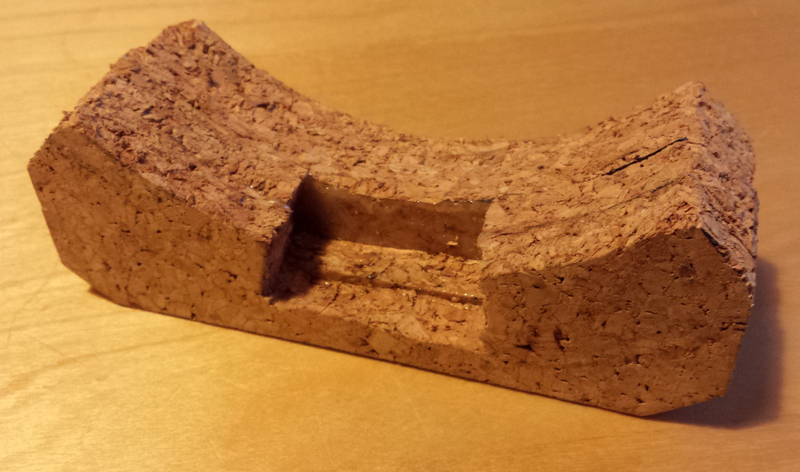 I had a mild brainwave and decided to cut up some old cork place mats to make a simple dovetail clamp/mounting plate. I started by cutting a cardboard template then used that to cut out the cork mats. I needed two with the dovetail shape cut out and two with just the profile of the ota. 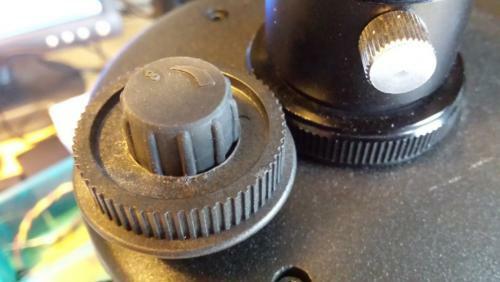 The next step was to drill out the centre of a toothed cog to fit over the focus knob on the ota. With the mk1 device I was simply putting the belt over the focus knob and relying on friction to stop it slipping which wasn't always reliable. I then glued all the cork pieces together to make a single lightweight block which will slide over the end of the dovetail and which I can mount the focuser device on. 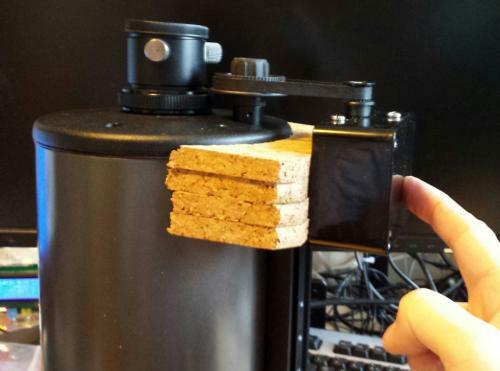 The next step will be to mount the rest of the components in the box and mount it on the cork block. This is what needs to go in the box and I also need a switch on the 2 bare wires at some stage. A shot of the rear of the cork block after some trimming. This shows the cutout section that slides over the dovetail bar on the ota. It's very light. Looks good Are you planning to release the source code? Thanks. Yes but I need to decide the best way. I will look into setting up a sourceforge project. I am very interested in this as it's something I want to do in time. 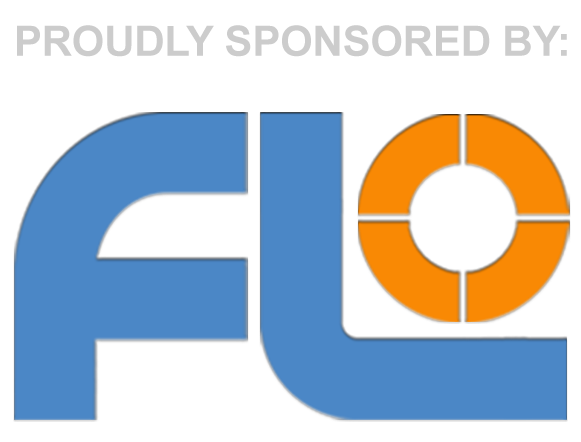 I have created a sourceforge page to host the software & documentation. This is the first time I have used SF so I don't really know what I'm doing . At the moment all I have done is upload the Arduino sketch and the Visual Studio solution. FocusAAF2 - a simple Winforms client application to drive the focuser. This was built using Visual Studio 2010 and you will need the Ascom platform 6.1 and Ascom Developer Tools installed. I haven't tried building it with any of the free 'express' versions of VS. I'll be adding documentation to the wiki over the next few weeks including parts list, schematic plus anything else I think is relevant. The code still needs some work but I've put it up as-is so you can take a look. Ive used Subversion for source code control as its what im most familiar with. If you need a client I can recommend TortoiseSVN which makes life easier as it integrates into the Windows Explorer. I'm going to look at making a smaller more portable version for my 127 as well, something that is removable for a start. 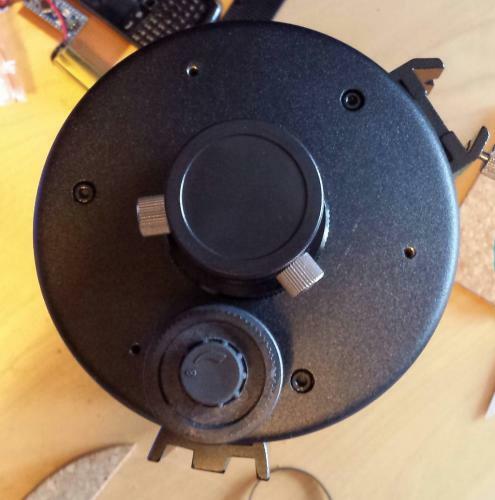 The C9.25 focuser looks good. Is it Arduino-based? This looks like a great project, I'll certainly have a go. I've never used an Arduino but I've been itching to have a go. If you could do an idiots guide for getting an Arduino talking to Ascom it would be greatly appreciated. The best place to start is the Ascom website. It has some very clear explanations of what Ascom is all about. There are also some links to videos that show you how to create a driver. Thats how I picked it up. I intend to create a standard installer for my driver but I dont get much time to spend on it at the moment. Sent from my Samsung G4S using Tapatalk. Ill be adding full details of my Arduino on the sourceforge wiki including circuit and parts as soon as I can. I did join the yahoo group but couldn't figure their focuser out. I wanted to do my own mainly as a learning opportunity to get to grips with both the Arduino and Ascom. That would be great. Arduino and ascom sounds a great combination for diy. Parts list has been added to the wiki on the sourceforge page. 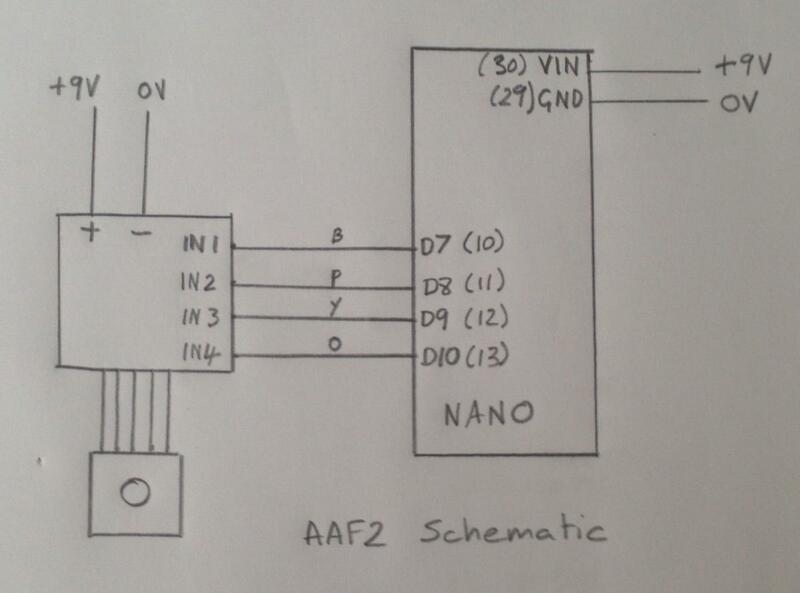 Next job is get a decent schematic. 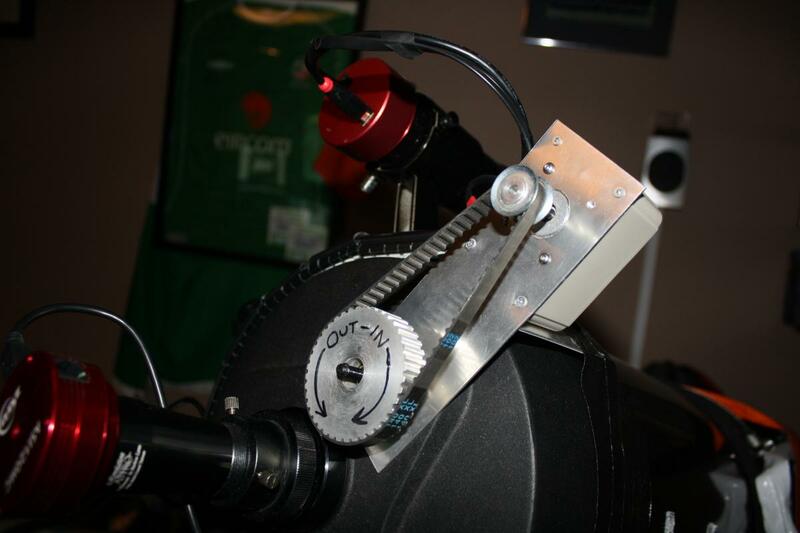 I had one drawn for the Mk1 focuser using gEda on Linux. When I went to look at it again some of the annotations (pin numbers, signal names etc) had disappeared. Hopefully I will get it done at the weekend. 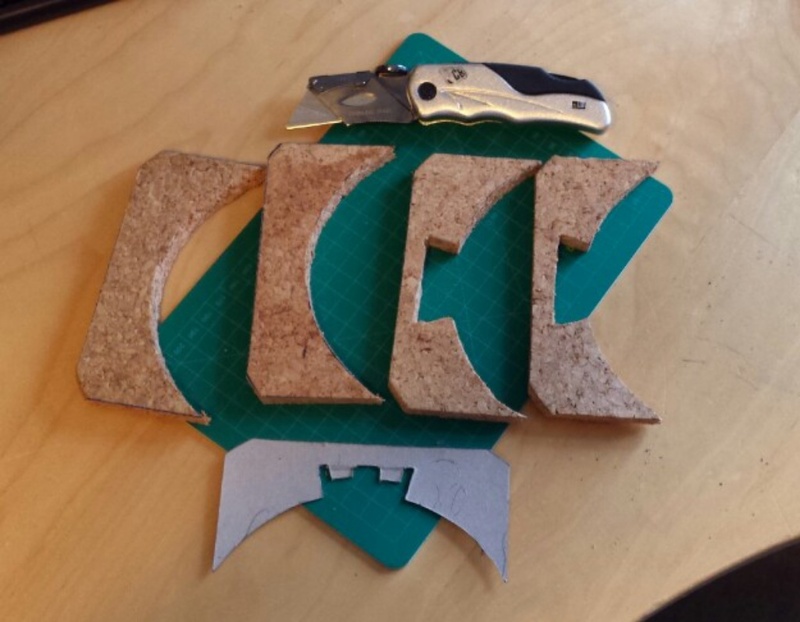 Rather than a 3D printer (using a commercial "shop" seems to work out at about 10p per cm³ ) what I've started using are HDPE kitchen chopping boards as a raw material. These come in nice convenient flat sheets of various thicknesses and are easily workable with hand tools and can also be heated, if you're careful, and molded into rough-ish shapes. The only drawback so far is that I haven't found an adhesive that sticks them reliably, so thickness needs to be added by mechanical attachment: screws, etc. Top tip of the day. Thank you very much, I'm off shopping. I put my Nanos in sockets. 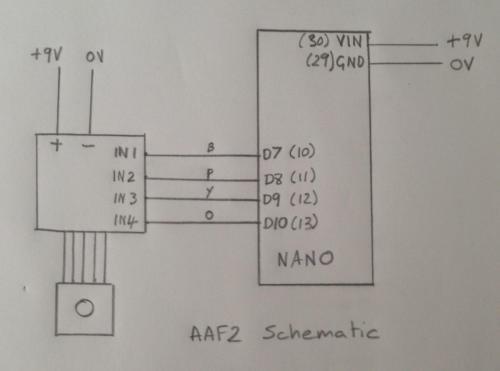 For anyone chomping at the bit, soldering iron in hand here is a sketch to show how to connect the stepper motor control board to the nano. This will work with the sketch I have posted on the sourceforge site. If you want to use different pins on the nano you can simply change the pins defined in the sketch.